My first day in Laos started in a jam-packed main dining table of Downtown Backpacker Hostel. It was raining when I arrived in Luang Prabang and braving the rain to look for my dorm was unavoidable. Since my hostel was fully-booked, I needed to wait for someone to check out around 12 noon. I was browsing on my Mac when some travelers joined me on the table for their breakfast. I later found out that the folks would be my roommates on dorm number two. Downtown Backpacker Hostel’s dorm 2. 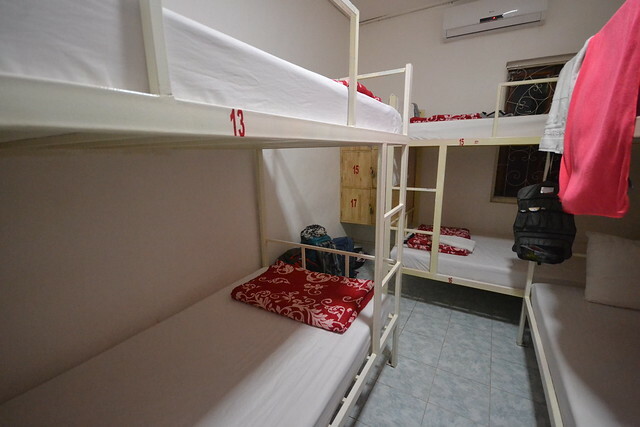 Dorm 2 of Downtown Backpacker Hostel is a 6-bed mixed dorm. On my stay, two American guys, a Korean guy, a Russian lass, and a German lady were my mates. Everyone instantly clicked and our long first night in Luang Prabang started on Mount Phousi during sunset. We arrived individually at the viewpoint and decided to have dinner together. And that started one of my memorable nights during my 100-day Southeast Asian trip. 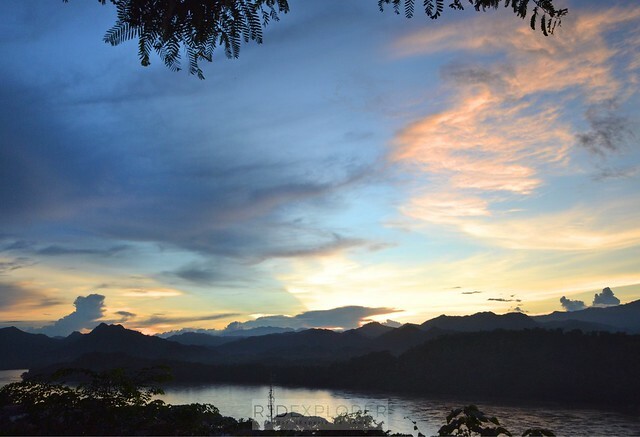 With most sunset viewings I had, the one in Luang Prabang was also a failed one. A dark cloud blocked the setting sun. 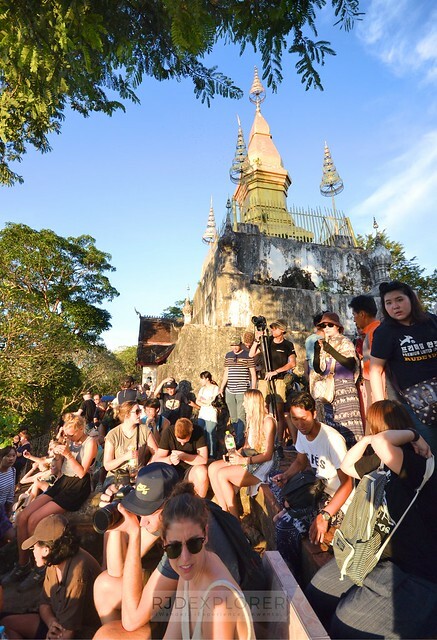 During our stay at Mount Phousi viewpoint, it was the crowd that made the late afternoon activity more interesting. An old Chinese guy went in front of everybody while his friend was taking his picture. A westerner guy then yelled, “Hey man, you’re blocking the view. “Everyone is after the sunset, not you.” It was mean but it was the most hilarious comment that afternoon. If you’ve been to Luang Prabang and visited the night market, there’s a narrow alley beside a famous rooftop cafe. The narrow alley is made narrower by food vendors. Some of them are offering a vegetarian buffet for LAK15,000 (USD2). For the amount, you could get noodles, rice, spring rolls, pasta, sautéed vegetables, fruits, and egg. After filling and dumping stuff in your bowl, you can join the queue and ask the vendors to reheat and add seasoning and chili on the food. Vegetarian Buffet in Luang Prabang. Dorm 2 occupied one table as we munched on the carb-filled bowls. The intense heat felt in the alley required us to get a fruit shake for LAK10,000. A German guy joined us and he shared the best spot to get a fruit shake in Luang Prabang. Continue reading as I will reveal it in the next paragraphs. 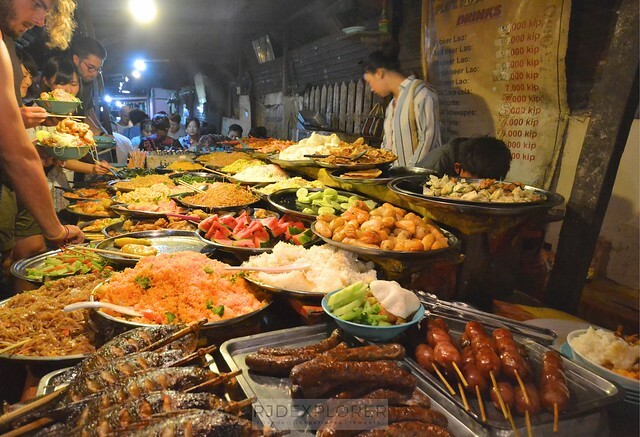 Every night, the entire Sisavangvong Road will be closed for the night market. You can find almost everything here and can bargain with the vendors, just be sure not to make stingy offers. What I like about the market is that it has more varieties than other night markets I’ve been to during my trip. There’s a vendor selling metal keychains and accessories made from metal-casings of bombs. Coffee and tea are sold in pouches with paintings. Drawstring bags, shirts, elephant pants, and a lot more. At one end of the bright red and blue-roof booths of the night market are fruitshake stands. Some of them offer a nice fruit shake, with whiskey. And since the German guy is in Luang Prabang for already 2 weeks, he found the best one. Why the stall we visited is the best one? Because she’ll ask you the amount of whiskey to add to your shake. She’s so generous that orders come in two glasses. Did I say the vendor is generous? And this literally started our fun night in Luang Prabang. Fruitshakes! 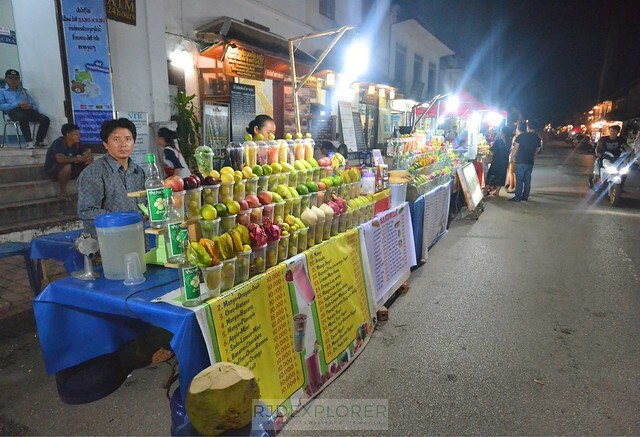 Look for the whiskey fruitshake stands when in Luang Prabang. We continued to Utopia, a famous riverside bar in Luang Prabang. At first, I thought it’s only a cafe for some relaxing afternoons in town. But I was shocked that it transforms into a cozy bar in the evening. Walking to the bar was really fun because it was located a hundred meters away from the highway. We trailed the alleys that dissect the residential houses leading to the bar. When we arrived at the bar, the crew tried to take our fruit shakes. I stayed outside because I was still halfway and I tried to enjoy more of the local whiskey. The bar got busy and the ladies went to attend some customers. Time to sneak in! We stayed in an open area where stars started to brighten the horizon. Culture sharing and a bit of politics were the topics covered. It was fun to see that despite having different political stands and culture, the group respected each other. We literally clicked! We were back at our hostel around one in the morning without any worries of waking up other people. Why? Because we were all out for the night, together. It was indeed a great night for everyone. A few days later, everyone headed to their own destinations. The Americans and the Russian lass took a bus to Vang Vieng, same with the Korean guy heading to Vientiane. German lady hopped on a slow boat to Pakbeng and Huay Xai. 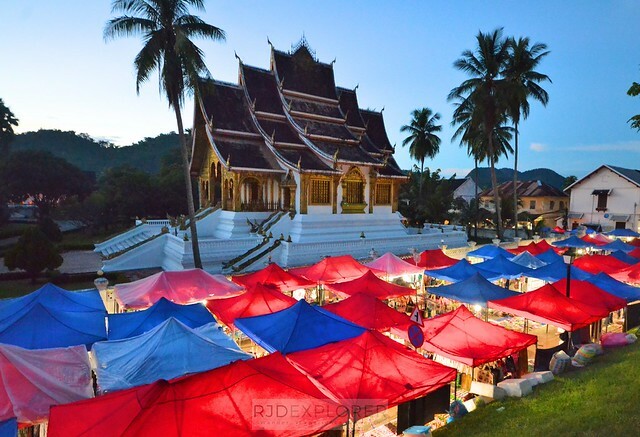 And me spending another night in Luang Prabang before continuing to Vang Vieng. We had our own destinations ways but we added everyone on Facebook and also created a chat group. This kind of experience is one of the main reasons why I prefer to stay at hostels because you can meet people that you get to hang out with. The company you build seems you’ve already known each other for a long time and the friendships will surely last especially that you have common grounds, and that is traveling. Next articleWhat Seats Are Business Class on American Airlines?